I wrote a summary article a couple of years ago discussing some probability aspects of the 2012 Presidential general election with a particular focus on exit polling. I’ve had a few people email me asking for the code I used in some if the examples. I have used this code since before the 2008 elections so I’ve made several changes over the years and now use it for many projects. 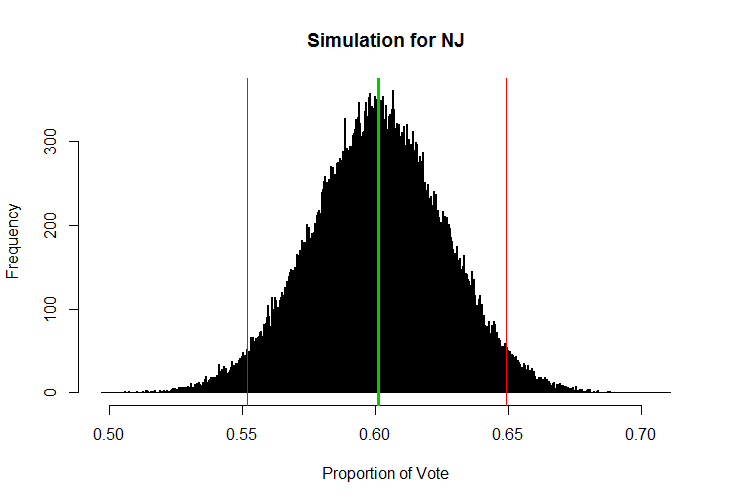 But here is the basic code to take the state estimates and compute the posterior distribution of the electoral votes. This code should run “right out of the box”. This approach works for methodologies considered simple random samples such as a landline/cell phone poll (e.g. surveying absentee voters by phone). However, applying this to an exit poll methodology is more complex than a phone poll as an exit poll is actually a stratified cluster sample design. For now I am posting the simple random sample code where if one wants they can extend it to more complex designs and models. The following snippet of code simulates the distribution of vote using the Dirichlet probability distribution. Though in this instance the Beta distribution would also work well enough as the Dirichlet is a multivariate generalization of the Beta. Using the Dirichlet distribution allows the distribution to be built using the top two candidates and then all other third-party candidates. Here the third-party candidates generally make up an insignificant portion of the vote. The example data is artificially generated but is based on true data. The data can easily be replaced with any other data. In addition to extending this code to more complex sample designs this code can be adjusted to accommodate more complex models or alternate distributions. This way other known variables can be applied to the model. ## This data was simulated during an earlier process for purposes of this example. ## The simulation is based on actual data collected from other surveys. ## "Probability-Based Estimation and the 2012 Presidential Election Exit Poll"
## Binomial distribution because in all states except Nebraska and Maine it is winner takes all. ## In NE and ME they use the Congressional District Method. But often all votes go to the same candidate. ## During 2008 election was the first and last time NE split it's vote when Obama received 1 electoral vote. ## This can be adjusted to further account for within state sample design rather than assuming an SRS within each state. ## Replicate the simulation. A greater number of replicates will smooth out the distribution.